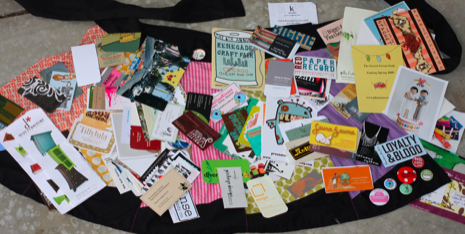 CHICAGO – Heavy rain and flooded roads slowed me down but didn’t deter my first Renegade Craft Fair experience. Even though I spent the day looking rather drenched, I met loads of fabulous people and foolishly exposed my camera to the elements to document the trip. I put on my apron and worked this show, folks. I worked it for you because I want to find the most interesting people I can to feature on upcoming episodes of CraftSanity. And let me tell you this show was a major jackpot of talent. By the time it got dark, I was very ready to stop saying: “Hi, my name is Jennifer…. and I’m the producer of the CraftSanity podcast… blah, blah, blah,” but so very glad I made the effort to meet so many creative people. I even met some CraftSanity listeners and that was a real kick. Even though I’ve been producing the show for going on three years, I still feel like I’m talking to five people when I sit down at the microphone and that’s probably for the best. My nerves might not be able to handle the truth. I started a Flickr gallery for you to check out because I have too many photos to post in this entry. I will be tagging the photos with IDs in the coming days to help you find the source if something catches your eye, but go ahead and check it out now. A special thanks to Gary, Tammie and Julie for making the trip to Chicago with me. I really appreciate your willingness to spend a day in the rain all in the name of craft. And, when I started to fade, thank you, Gary, for helping me spread the word about CraftSanity and scout for talented people to interview on upcoming shows.We didn’t make it to every booth before dark, but we get an “A” for effort. If any of the talented artists I met Saturday found their way to this site, I’d like to say: Welcome! It was an absolute pleasure to meet you. Thanks to all of you for indulging my exuberance about what I do and answering my questions about what you do. Part of me wishes I could have stayed in town for Day 2 of the fair, but my schedule didn’t allow for that this year. Perhaps next year the road trip will last a little longer, we won’t need umbrellas and I’ll get to meet every single vendor. I also hope to meet the fair organizer, Sue Daly, too. I looked for her, but didn’t get to meet her this time. She puts on an impressive craft fair, even in the rain. 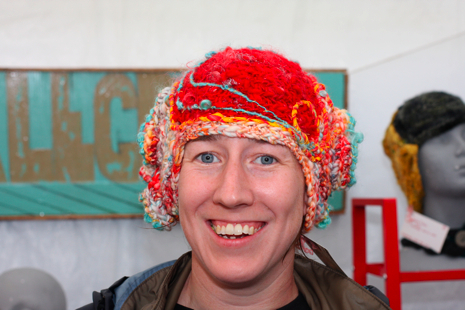 Heather Baris, of Girl With a Hook fame, was kind enough to let me try on one of her free form crochet hats. It was toasty warm, but not really suitable for a flitting about in an apron during heavy rain. So this will remain the hat that got away. I hope it found a good home. Check back tomorrow for more about the people I met at Renegade.